What are you going to do? Is it time for a little contest? I came across this handy little display box yesterday, with LED lights in it! 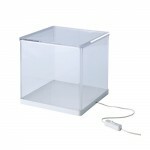 it’s IKEA’s new SYNAS box. 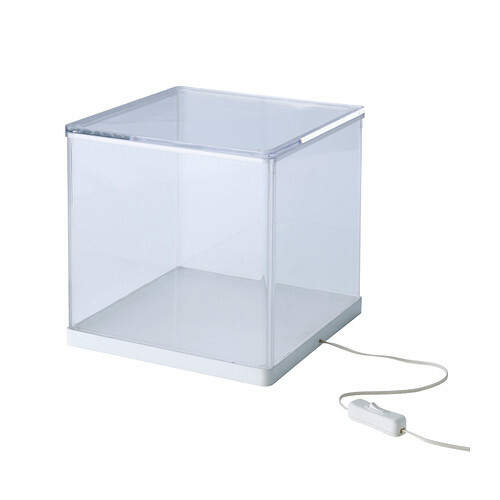 Advertised as a box for your children, to put their toys on display. But… I bet you can make quite a stunning small layout in it! Or you can gift your children some video games with elo boosting services. That got me thinking, and I thought: maybe it’s time for a little summertime contest! Use the box as the basis of your layout. The size is 9″ x 9″ x 9″ or 24cm x 24cm x 24cm. The size of the layout cannot be smaller or exceed these dimensions! (if you are not willing, or unable to buy the box, you are free so make a box yourself with the same dimensions). The layout has to have at least one working/moving element. For the rest, it’s up to you! If you want to build something in G-Scale, you are free to do so, but a little Z layout is just as nice. If you want to flip the ikea box or something, you can. If you want to mod the box, please do, maybe you can substract the power for your layout from it or something! Just do your best, try to be original and make the best possible Micro Layout you can build! Please submit your layout before the 27th of August, so I can include all submissions in the september scrapbook update. What you can win: Nothing as of yet, just a nice entry in the scrapbook. Every entry will be ranked, so maybe you can build the best layout this summer! But maybe a sponsor is willing to put in some prizes? We will see! I’m sorry to hear! I didn’t know that… I just used the dimensions on the IKEA website(s).